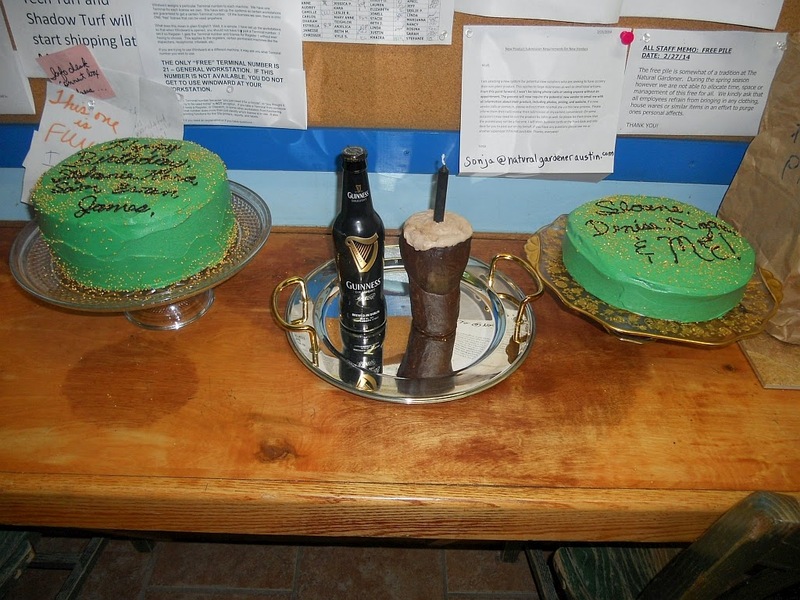 The Redneck Hippie: March Birthday Cakes - or, What Can Be Better Than BEER CAKE! 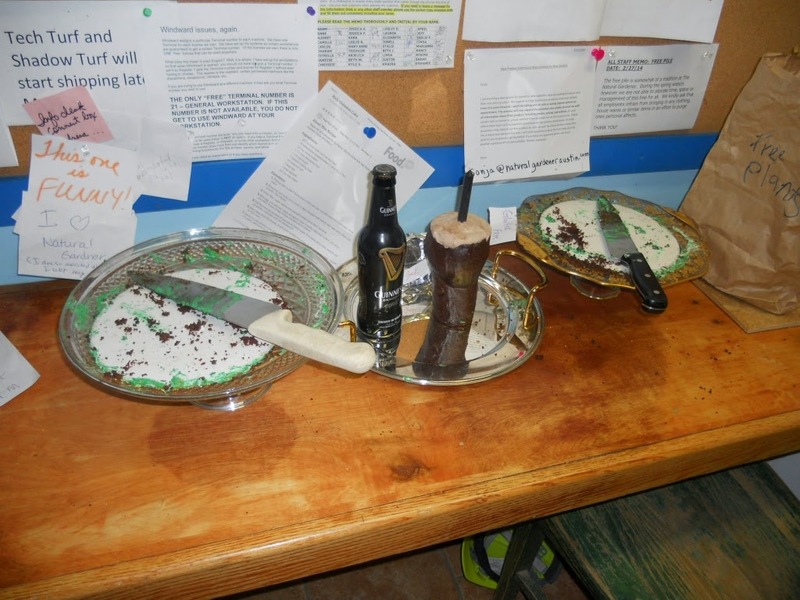 March Birthday Cakes - or, What Can Be Better Than BEER CAKE! This month, a coworker was turning 21. That's a milestone birthday, so I thought something special was in order. That week was incredibly hectic, so didn't really have time for anything fancy. 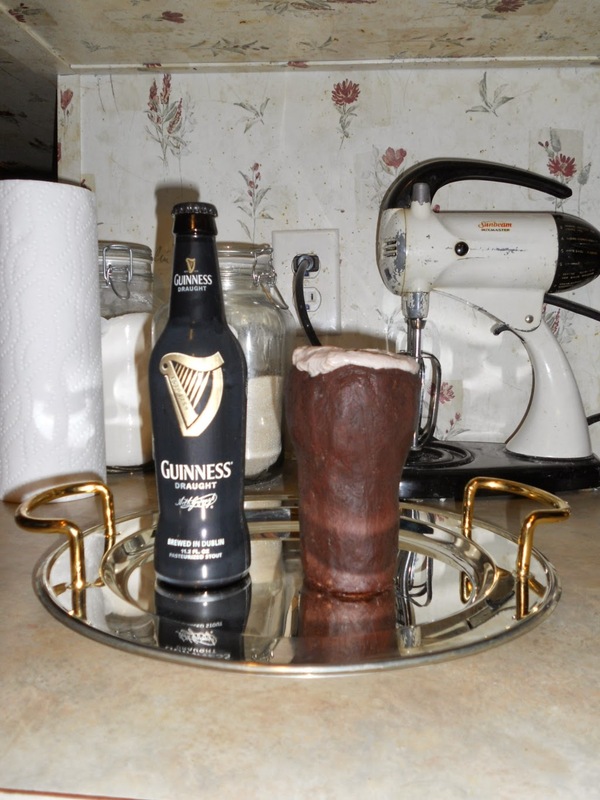 I had a recipe for Rich Guinness Cake in my "To Try" book, so decided to make that to mark the occasion, bring it in on his actual birthday on the 16th (Bonus: Guinness cake doing double-duty for St. Patrick's Day! ), and call it good. But I'd had a thought that building a cake in the shape of a pint would be so cool. I've wanted to try sculpting a "3D" cake for a while now. It would be fun, funNY, and fabulous! ... But ... With so much going on this week, I didn't think I'd be able to pull it off. So I relegated it to "next year" or "someday". I always do that. I always think of learning how to do something that sounds interesting, or building some cool thingamabob I dream up, or trying something new that piques my fancy, but I have a bad habit of saying "someday", "maybe next time", "one of these days...", instead of actually doing it. A year or two ago, I made a resolution to stop doing that, to push myself instead of procrastinating and relegating things to the SomeDay Pile. I've done pretty good at breaking that habit. That's why I teach preschool now, give classes and talks at libraries and garden clubs, and have an orchard out back of a huge vegetable garden with raised beds and an asparagus patch in it. It's also the impetus for the Monthly Birthday Cakes for everyone at work - I'd been wanting to learn to bake tasty, pretty cakes for years, so jumped right in, thinking that if I screw up it wouldn't matter. I mean, who complains about free cake, right? So the thought of building that pint cake kept bugging me. I really wanted to do it. But I didn't have the time. I really didn't - one of my other resolutions a while back was to quit stretching myself too thin with too many things to do and to make time for myself, time to do things that feed my soul. I try to only do things now if I really enjoy them. Regular wheat-flour cake on the left, gluten-free on the right. The resolution to scale back is at odds with the one to chip away at the Someday Pile of course. So what's evolved from these conflicting resolutions is this: When I am faced with Doing Something Cool And Fun Just Because I Can, I put it in the Maybe Pile. Every so often, I take a look at that pile and see what's floated to the top. 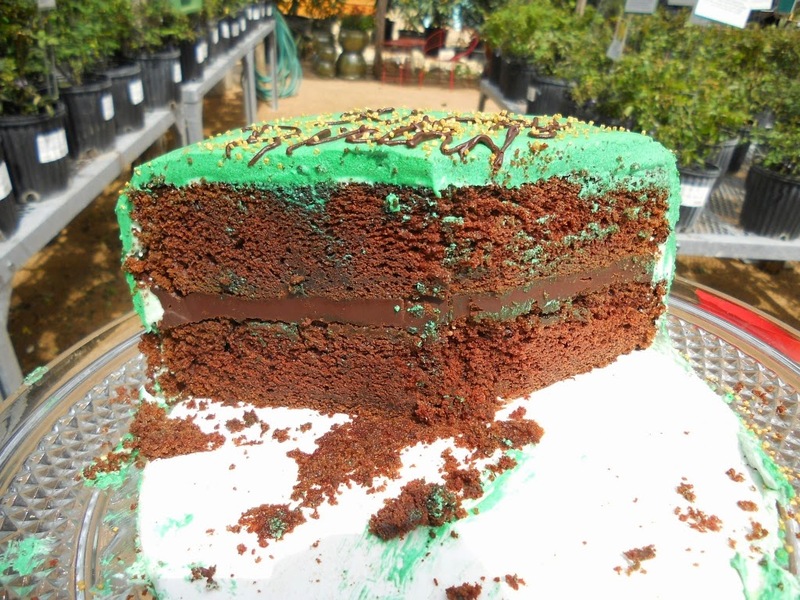 For days, Pint Cake was on top, jumping up and down, yelling, "Make me!" I kept thinking about how I'd do it, turning ideas over and over in my head - use wire to support it ... no, didn't have any food-safe wire ... bamboo skewers, yes! ... glass, what to use for glass ... homemade gummy! ... but it would leave a seam ... hmmm ... maybe dark chocolate would be shiny enough ... mmmmmm, dark chocolate ... And on and on it went. So I decided I'd give it a try, but NOT make a plan to definitely do it. I would just play, and maybe learn something even if I didn't end up with a Pint Cake. 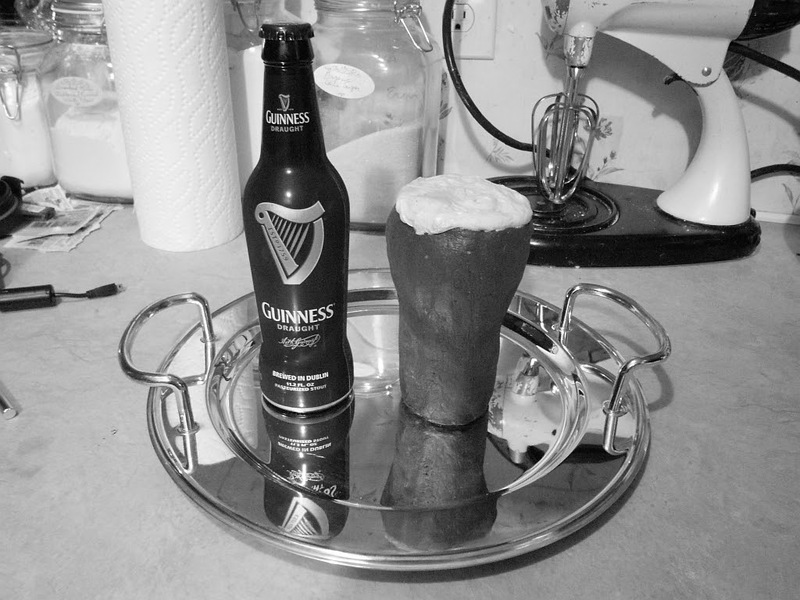 When I baked the Guinness cakes for that month, I poured a little extra batter into a shallow pan to fool around with. I cut out some circles, small ones and bigger ones. I stacked them, put toothpicks in them, thought of how much that would hurt if someone bit into them just right, removed the toothpicks, restacked them, thought maybe glue would be better, put dowels in them, and otherwise cogitated and ruminated on just how to do this. Ultimately, I succeeded!! And it was so cool. My first sculpted "3D" cake. And I'm insanely proud of it. While baking the other cakes, I poured a thin layer of extra batter into a 4" x 18" cake pan. It baked up to about an inch and a half tall, or thereabouts. Using round cookie cutters in two sizes (2 1/2" and 3"), I cut four pieces from the cooled cake, two of each size. Out of a cardboard cake board, I cut two round pieces the same size as the smaller cake pieces and stacked them to form a base, then stuck three wooden skewers through the two layers of cake board, spacing them out in a triangle pattern a bit apart from each other. 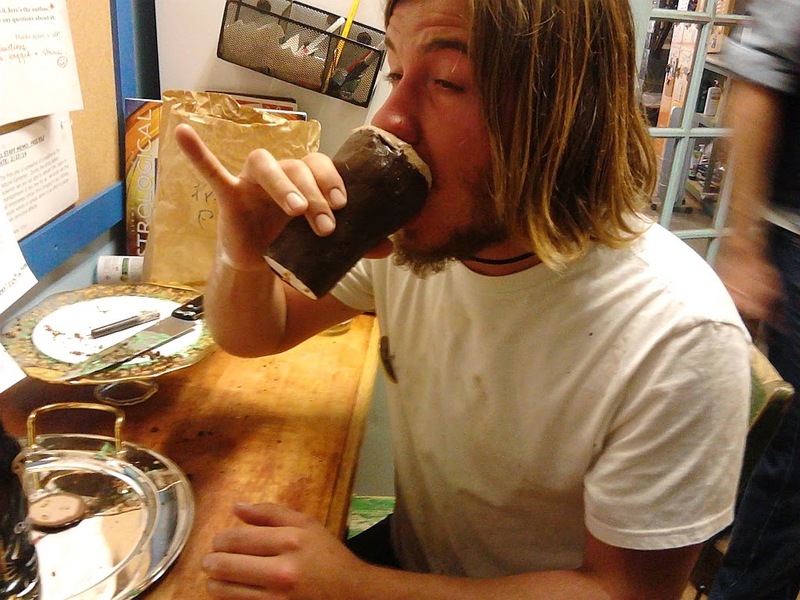 I love how he looks drunk almost more than I love the pinky. I slid the cake pieces onto the skewers, top down, small pieces first (for the base of the glass). Once I got them skewered and snugged at the bottom of the skewers, I noticed the cardboard bases were a bit bigger than the cake, so I trimmed them with an exacto knife. Once I was happy with how it was sitting, I covered the sides including the cake board rounds with extra-strong chocolate ganache. I refrigerated it 'til it was hardened (I left it in overnight, but an hour in the fridge or half an hour in the freezer should do), then took it out and added another thicker layer, then back in the fridge. Once it was hardened again (overnight again, but as before, less time would do), I took it out of the fridge and let it sit about half an hour while I made the icing for the other cakes. Then I smoothed the sides with my warm hands. It was still quite hard, but the warmth from my hands was enough to melt the chocolate just so that it was a bit pliable, enough that I was able to sculpt it into a more realistic shape than it had been in, with slowly sloping sides and crisp top edge. Took them just three short hours to finish them all off. Lastly, I rubbed on some coconut oil to give it a bit of sheen like glass, using a piece of plastic wrap to rub with so I didn't leave more fingerprints (be sure to rub long enough that all the chunks of unmelted coconut oil are melted and smoothed out). Then into the freezer for an hour while I iced the other cakes. Next, I trimmed the wooden skewers to just above the top of the cake, leaving enough to stick up a bit and help hold the icing that would be the foam. For the foam, I used some of the cream cheese icing I'd made to ice the other two cakes - removed some from the mixing bowl before adding the green color, and slightly tinted it with cocoa. Then back into the fridge with it. I glued it to the cake plate with some of the ganache, then put it back in the fridge. It was stuck on so well that when I took it out of the fridge the next morning, I could turn the plate upside-down and it stayed on! But, when I tried that trick an hour or so later at work, it fell off. ACK! Luckily, I caught it and only put a couple fingerprints on it. Whew! So much for showing off! I filled it with the rest of the ganache. A seam of chocolate in there was nice. ♣ Preheat oven to 350°F. Butter one 8-inch round cake pan. Line with parchment or wax paper. Butter paper. ♣ Bring stout and butter to a simmer in heavy saucepan over medium heat. Add cocoa; whisk until smooth. Cool slightly. ♣ Whisk flour, sugar, baking soda and salt in large bowl to blend; set aside. Beat egg, yolk and sour cream with electric mixer in another large bowl to blend. 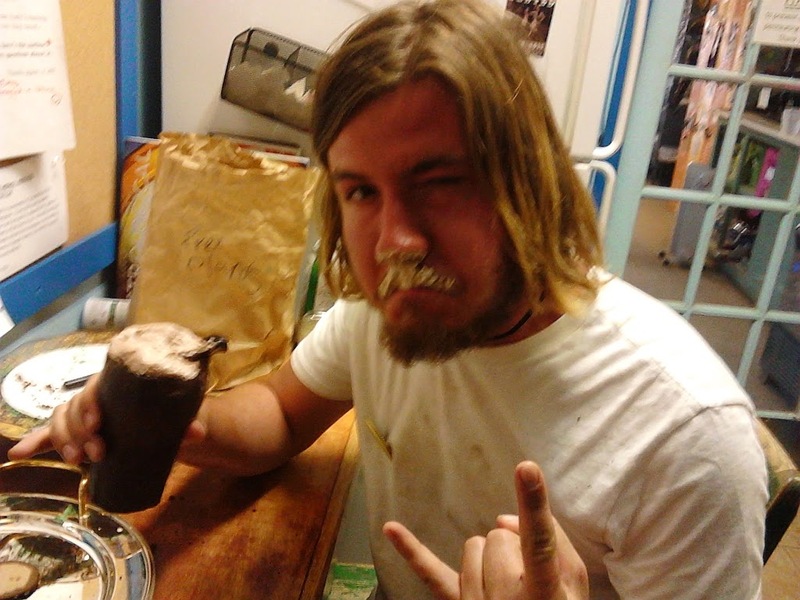 ♣ Add stout-chocolate mixture to egg mixture, and beat just to combine. Add flour mixture and beat 30 seconds on slowest speed. Fold batter using rubber spatula until completely combined. ♣ Pour into prepared pan. Bake about 50 to 55 minutes, or until tester inserted into center of cake comes out clean. Transfer to rack; cool. I saw this in a thread on Cake Central. A poster was raving about how firm it was and what a wonderful base for further decorating. It's a LOT like the recipe for White Chocolate Ganache on Food.com. Warm the cream in a double boiler over medium heat. Add the chocolate, broken up into small bits. Continue to heat, stirring occasionally, until chocolate is melted, fully incorporated with the cream, and smooth. Mix the cream cheese and butter with an electric mixer on low until fully mixed and smooth. Add the sugar, one cup at a time, allowing each cup to mix in thoroughly before adding the next. Continue adding sugar until you get the desired consistency. Optional: You can add a teaspoon or two vanilla or other flavoring of your choice, as well as color if desired. This is fast becoming my go-to frosting since you can use it for a main covering as well as piping, it's so versatile (any kind of flavoring or color goes with it), and everyone LOVES it (and it IS good - better than regular buttercream). I've gotten so many compliments on it. It's one of the main things people ask about. Spring! It's Spring in the garden!